I’m thinking about the Spirit of Christmas and all that it represents. For me this time of year has really been invigorated by experiencing it with my child. The pure unadulterated joy and wonder of a child seeing a garden of lights brighten up the night was just as magical for me as it was for him - but for a whole other reason. Oh, to experience beauty with one’s whole heart - no guard, no defense, just as wide open as a window to the poetry of life. He ran from tree to tree, clasping his hands over his forehead as if it was just too much to take in. He gasped and said "Mommy, this is just more beautiful than my best dreams!" With each new color he said- "Mom!!!! Turquoise!! It's BEA-UUU-TEE-FULL!" Then he would run to the next tree and say "Mom!!! Yellow!! It's yellow!!! Your favorite color!! Can you just believe this?!" I tear up now just remembering the moment. It was especially sweet for me to see his joy as earlier that day we had one of those conversations that as a parent I was just not prepared for. Kase has always had a wonderful imagination - he plays for hours pretending he is a bunny or a dragon, he becomes so lost in his play of make believe. But he has also always has one foot very firmly planted in reality. And I have loved this about him. My son is a mixture of strength and sweetness. Intelligence and creativity - and he finds a balance intuitively to express both these parts of him that I find utterly remarkable. We have been talking a lot lately about listening to his inner voice - his heart, his intuition, whatever you want to call it. I hope to raise a child who has a strong connection to his inner voice - his own gauge and sense of truth. It is the best guide as he grows older and finds himself in those moments when I am away and unable to chime in. He will have countless moral decisions to make as he grows outside of my watchful eye that will involve things like weather or not to go along with peer pressure or how to behave when no one is watching. I want him to develop a good relationship with his intuitive inner knowing - all this crossed my mind when he asked me about Santa. As excited as he has been about Santa - and he has been excited - I could tell that something just hasn't added up to him. I remember last year he didn't really believe in Santa, and it seemed like as he heard presents were inextricably intertwined with Santa, he began to buy in. But I always wondered if he was having to force himself to. There was just something about the way he went into it this year that seemed a bit willfully credulous. It made me wonder if he told himself "well, this is how I get presents, I'm gonna go all in!" But the year has not only been filled with anticipation and glee for Santa’s visit, but also peppered with probing and somewhat skeptical questions - Finally he asked me a direct question about it. I looked at him in the rear view mirror. His face was solemn. He was asking for real. "Well, what do you think, honey?" I said. "I just don't know. I was wondering I guess" He answered, looking down. I took a deep breath. "Do you want the truth?" "Yes" he said. "I want the truth, Mommy." Holy crap. I was not expecting this. I had no idea what to do! To be honest, I have hated lying to my child about Santa. I have no intellectual problem with the whole Santa thing. It's sweet. It's fun. No harm done. But still, it pained my heart every time he asked me a direct question about how it all worked and I had to come up with a lie. I don't feel comfortable lying to him - even about something as harmless as Santa. But I was going along with it until I noticed there was an inner conflict going on inside him. Something wasn't adding up for him he could not put his finger on, yet I was participating in telling him to ignore that inner voice and just believe what he was being told. Of course reindeer fly. Do the ones at the zoo fly? No - just Santa's. How does he know what billions of kids want? Oh, well, he has a huge list of all the kids in all the world. Yes, he gets to them all in one night. Yeah, even in different time zones. Yup, the whole world. Yes, that is a lot houses. Well, magic. Magic helps. As a side note, Kase and I have also been talking a lot about lying lately. He has made up some fibs and I have stressed how important it is that I can believe him so that I can trust what he says. He lives in a world where fiction and play are so closely linked to reality - and I often find myself asking him after he tells me a tall tale "oh? Is that what you wished happened, what really happened?" I try to help him find a gracious way of finding that line between truth and fiction. Creativity and lying. And finding the truth in his heart. So as silly as it sounds, this thought smacked me in the face every time I told him another lie about Santa. But Santa is innocuous. So how to handle this? I hadn't really thought it through or prepared. I certainly wasn't going to spill the beans this year. He had been enjoying all the Santa talk, even writing him a letter. Children are so open and even hard wired to believe what their parents tell them. They have to be. Their survival depends on trusting their parents to teach them and guide them, in the early years especially. I take this as a sacred duty. I didn't realize just how sacred I felt this relationship of trust was until he asked that fateful question. My mind drifted off as I drove, racing between the few options I had here. Kase snapped me back. "Well Mommy? Is Santa real? Like for real real?" "No Kase. Santa is not real." "What?!" He exclaimed. "He's not real?!" His lip jutted out and his eyes brimmed with tears. I thought to myself - oh no!! What had I done! I could not put this Genie back in the bottle! "But Mommy! Why isn't he real? Why does everyone lie about it?!" "Well, you know how we play make believe - and you pretend you’re a baby bunny and I'm a mommy bunny and we eat invisible lettuce in your room? And how fun that is? Well, it's fun for mommies and daddies to pretend with their kids about Santa in the same way. Everyone has fun. It was based on a real story - there was once a man named Saint Nicholas who gave out presents to kids in his village a long time ago and taught people what it meant to give without expecting anything in return and what a gift that was in its self. The story of Saint Nicholas spread and grew from there." I think I had read this somewhere. I was grasping at straws and winging it here. "But how do I get my presents? Who gets them for me?" "But Christmas isn't about Santa or gifts anyway, Kase. It's about the Magic the season brings - the joy, the open hearted kindness it inspires, and what the holiday is actually about." We visited about the real meaning of Christmas for a while, but soon he came back to the whole Santa thing. He was really upset. 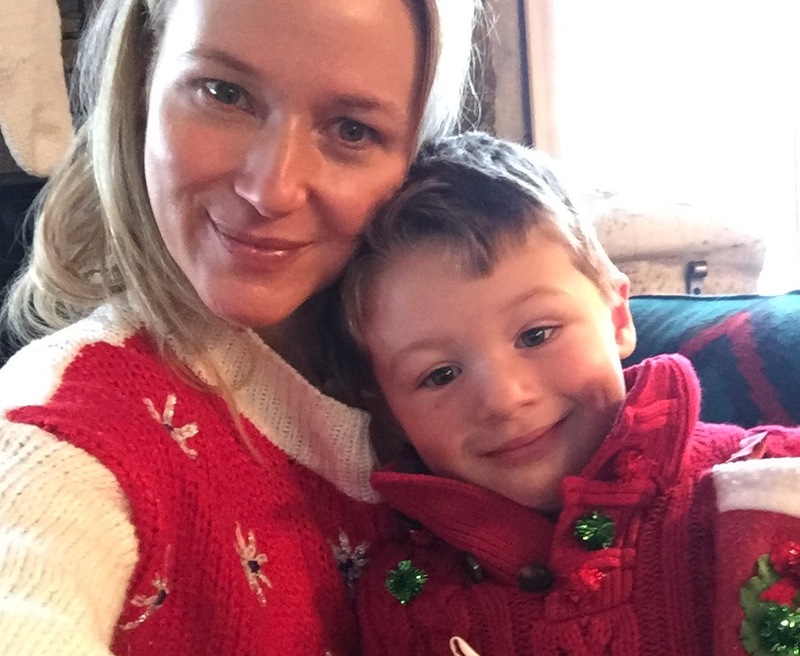 "No no no - But Mommy, I sat on Santa’s lap - remember?” Ugh. Yeah. I remembered. Oh how tangled this whole Santa web is we weave. "Well, he is not the actual Santa. Very nice people sit in as Santa, to represent the one that might have been around a long time ago. They listen to your wishes and help the mommies and daddies know what presents you want to help keep the spirit of Christmas alive." I checked his face in the rear view mirror, his eyes were brimming with tears and he was really searching for how on earth to react to this news. "But I want him to be real! Can he be real Mommy?" "Yes, you can choose to believe in him. I'm fine with that. It's up to you." "Ok Mommy. I think he is real." My heart broke. Had I done the right thing? Did I just ruin Christmas and break my 4 year olds heart and take some innocence away from him? Or did I do the right thing and unwaveringly tell him the truth? I hope I did the right thing. I hope somewhere in my sons brain he adds 3 things up. 1) To listen to his inner voice and ask questions. 2) To know I will always tell him the truth in life. Even hard ones. 3) To feel free to choose to believe what he wants. So all this was running through my head when I took Kase to see the Holiday light display at Cheekwood later that night. Would it be the same? Would he still have the childhood magic? Would he love it? Much to my relief - Kase was beyond thrilled and enchanted and reached such a state of rapture that my mom heart finally relaxed - a little. "Mom, I feel the Christmas spirit!! It's so beautiful! I just can't believe it! The Christmas Spirit is REAL!" I still don't know if I did the right thing. It happened too fast and I just winged it. I'm sure there will be harder things in the future that I'm unprepared for - but all I can say is that good, bad or otherwise, I felt in my heart for what I thought was right at the time. That's all I can hope my son does in his own life. We won't always get things right. We may even hurt each other along the way. As long as our intentions are pure, despite any twists in the road, we will always find our way closer to one another. 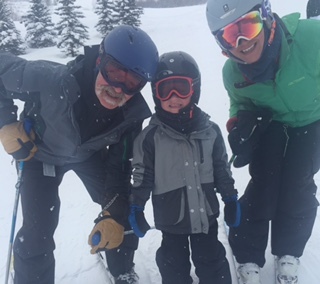 Kase had a wonderful Christmas - one with Ty in Texas and another here in Telluride with me and my dad and Lee. He is back to believing in Santa and has not asked more about it. As for me, I had a thrill watching his pure child's heart soak in the real magic of Christmas. His heart filled with wonder, head bent back, catching snowflakes in his open mouth, making snow angels, baking pies, and helping decorate the tree. 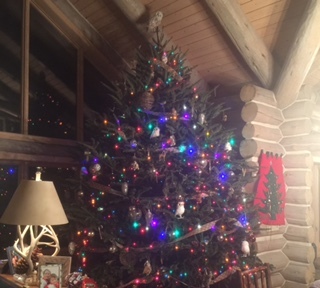 I hope you all had a wonderful Holiday, here is to joyous New Year! 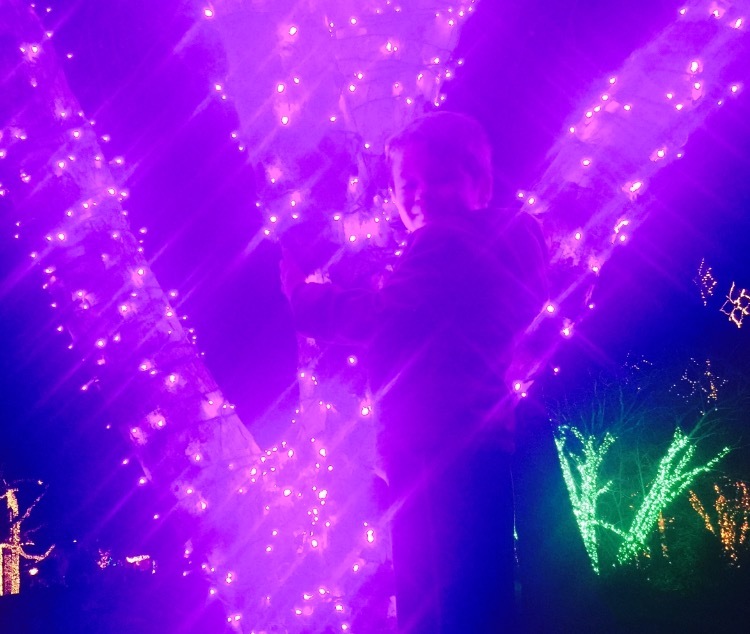 Kase at Cheekwood Botanical Garden's Holiday Light Show 12/14/15 in Nashville.